The idea of the Bounceback Portfolio is that a portfolio of the 10 worst performing FTSE 350 stocks in one year has historically beaten the index in the first three months of the following year. The selection of the Bounceback Portfolio stocks for 2014 was described in this earlier post. The following chart shows the performance of the stocks in the Bounceback Portfolio 2014 over the first three months of the year. The portfolio as a whole increased 9.2% in the first quarter 2014, which beat the -1.6% return for the FTSE 350 Index. This means the Bounceback Portfolio strategy has now beaten the index in 12 of the past 13 years (the one failure was last year). Other posts on the Bounceback Portfolio. 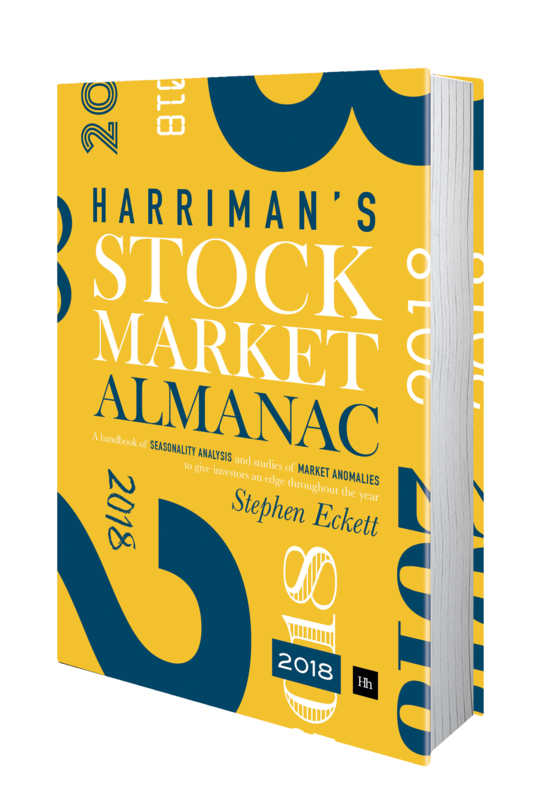 The 2013 edition of the Almanac explained the Bounceback Strategy, whereby a portfolio of the 10 worst performing stocks in the FTSE 350 in one year is held for the first three months of the following year. The following table lists the 10 worst performing FTSE 350 stocks in 2013 (i.e. 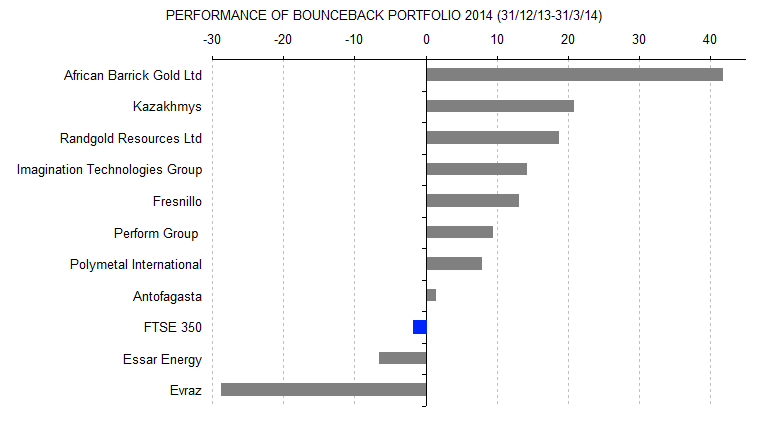 these comprise the Bounceback Portfolio for 2014). More on the Bounceback Portfolio. After a usually disappointing May and June, shares tend to perform a bit better in July, but not by much. July ranks 9th of all months for performance. On average the market increases 0.8% in July, with a probability of a positive return of 55%. 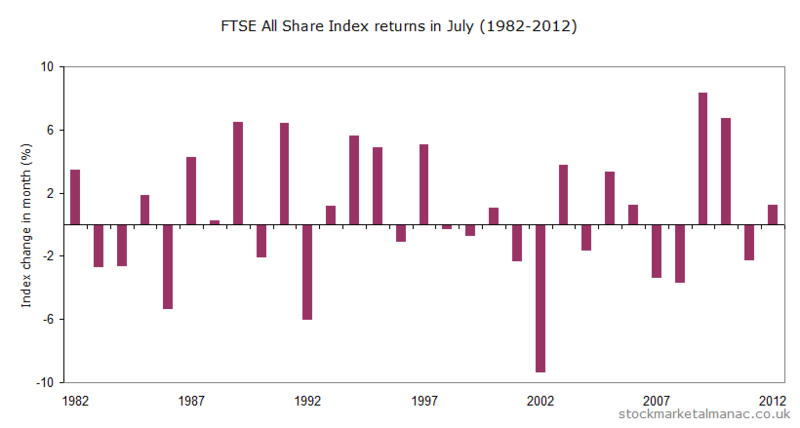 The accompanying chart plots the percentage performance of the FTSE All Share Index for each July since 1982. For example, last year in 2012 the market rose 1.2% in July. In the last 20 years the market has risen 11 times in July. The market has risen on the first trading day of July 69% of years since 1984 – making it the strongest first trading day of any month. And the strength has tended to continue for the first week of trading (making it one of the strongest weeks in the year). After that, the market has a propensity to drift lower for a couple of weeks until finishing strongly in the final week of the month. Although this may not be an exciting month for the overall market, there can be a fair degree of divergence of performance at the sector level. Historically the sectors that have been strong in July are Chemicals, Personal Goods and Real Estate Investment Trusts while weak sectors have been Gas, Water & Multiutilities, Support Services and Beverages. At the stock level, the following companies seem to like July: Experian, Greene King, Imagination Technologies, and Senior – these shares have risen in at least nine of the last ten years in July (Greene King is the only FTSE 350 stock whose shares have risen every July since 2003). While the two worst performing shares in July over the last ten years have been Petra Diamonds and Serco. July has been the most active month for flotations; over 50 of the companies in the FTSE 350 Index have had their IPOs in this month. (Perhaps this is to allow company founders to go shopping for yachts in the summer months?) One such July IPO was for Antofagasta which floated on 5 July 1982; coincidentally, in recent years July has been the best month for the company’s shares. The longest-listed company with a July flotation date is one of the odder companies on the LSE – Law Debenture Corporation. The date to watch this month is 4 July when the MPC interest rate announcement will be made, and the New York Stock Exchange will be closed (Independence Day). Article first appeared in Money Observer. The following table lists the four FTSE 350 shares that have the best returns in July over the last ten years. For example, Greene King has an average return of 6.6% for the month of July. Each stock has risen in at least nine of the past ten years in July – Greene King is the only stock in the FTSE 350 whose shares have risen every July in the past ten years. A portfolio of these four stocks would have out-performed the FTSE 350 Index in July in nine of the last ten years with an average out-performance of 4.4 percentage points each July. The following table lists the two FTSE 350 shares that have the worst returns in July over the last ten years. For example, Petra Diamonds has an average return of -5.8% for the month of July. Both stocks have fallen in at least eight of the past ten years in July. The 2013 edition of the Almanac looks at the historic monthly performance of the FTSE 350 sectors. Here we look at the Technology Hardware & Equipment sector. The following chart plots the average out-performance of the FTSE 350 Technology Hardware & Equipment sector over the FTSE 100 Index by month since 1999. For example, since 1999 on average the sector has out-performed the FTSE 100 Index by 4.0 percentage points in July. The strongest months have been July and November – the sector has under-performed the market only three times in July in the last 14 years. The weakest months have been February and September – the sector has out-performed the market only five times in February in the last 13 years. The following table lists the five FTSE 350 shares that have the best historic returns in February over the last ten years. For example, Fidessa has an average return of 14.9% for the month of February. Each stock has risen in nine of the past ten years in February. A portfolio of these five stocks would have out-performed the FTSE 350 Index in every February over the last ten years with an average out-performance of 9.5 percentage points each February. The following table lists the five FTSE 350 shares that have the worst historic returns in February over the last ten years. For example, AstraZeneca has an average return of -3.5% for the month of February. Each stock has fallen in at least seven of the past ten years in February. A portfolio of these five stocks would have under-performed the FTSE 350 Index in every February over the last ten years with an average under-performance of 3.3 percentage points each February.